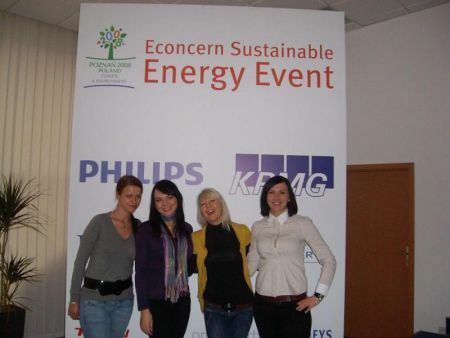 From 1 – 12 December 2008 the Econcern Sustainable Energy Event was held in parallel with the 14th Conference of the Parties – COP 14 – in Poznan, Poland. The event provided a most inspiring platform for politicians, business people and representatives of the media who are interested in finding practical solutions that will help achieve the ambitious climate change goals discussed at the Conference. The Econcern Sustainable Energy Event was organised for COP 14 attendances who seek interaction between governments, NGOs and businesses. The initiative was sponsored by Econcern, Philips, ING, KPMG, Teijn, HP, One Carbon and Ecofys. Over 70 speakers and panel members from around the globe, shared their idea’s, visions and new insights with the 2500 visitors of the event.